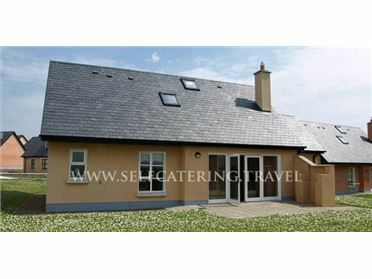 Mountain View is a mostly ground floor cosy detached cottage set in the countryside a few miles from Ballina in County Mayo and can sleep six people in two double bedrooms and a twin room. There is also a family shower room. The rest of the cottage contains an open plan living area with kitchen, dining area and sitting area. To the outside there is secure ample off road parking and lawned gardens to the front and rear with patio, furniture and barbecue. Mountain View is ideally located for touring this delightful region of Ireland and will suit a family or couples looking for a rural break away. Oil central heating. Electric oven and hob, microwave, fridge/freezer, washer/dryer, TV with FreeSat, selection of books. Fuel and power inc. in rent. Bed linen and towels inc. in rent. Cot, highchair and buggy available on request. Secure ample off road parking. Lawned front and rear garden with patio, furniture and BBQ. Sorry, no pets and no smoking. Shop and pub 10 mins walk. Knock Airport 30 miles. Note: There is restricted headroom in the eaves twin, care should be taken..